Mã hàng :Máy khắc cắt laser SA Hai đầu cắt. 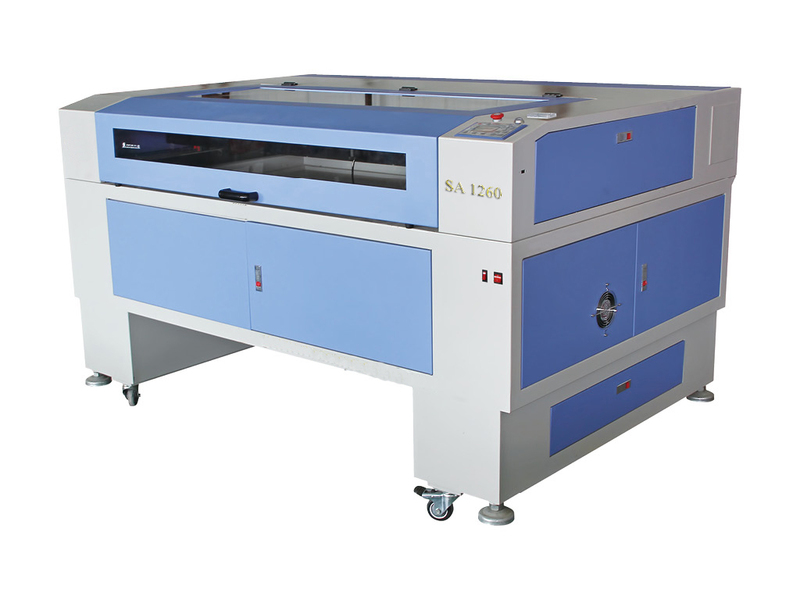 GS1260D,GS1280D,GS1490D,GS1612D- Double Heads Laser Machine YueTai double heads laser engraving and cutting machine adopts double laser tubes, double laser powers, double light paths and double laser heads. Its working efficiency is equal to two single head machines. It can also work with full surface by single head. YueTai laser engraving and cutting machine adopts DSP digital control technology, it is no need to connect computer, and auto saving, auto processing, which makes the machine faster, more stable and more precise. Specifications： Model GS+D Laser power 60W/80W/100W Engraving size 1200*600mm, 600*600mm etc Engraving speed 65000mm/min. Dimension 1730*1060* 1080 mm Engraving resolution 0.025mm Resetting accuracy 0.01 Image format AI,Plt,Cdr,Dxf Dst,Nc,Bmp,Jpg Minimum Letter English Letter: 1mm*1mm Power supply 220V/50Hz Gross Power <1000W Operating Temperature 0C°~45C° Special Features:1. 64 DSP high speed processor: GS 2nd laser cutting; engraving machine adopts 64 DSP high speed control system, which highly improved the data processing speed and stability.2. Optimization of Arc engraving: The laser machine uses the arc processing system, this technology can perfectly deal the curve and circular arc, which can cut the edge smoothly.3. Support of USB connection and U Disk: Our laser machine supports two kinds of connection patterns, the first way is the USB to connect the machine with computer directly, the second way is to adopt the U Disk independently, this way you can use only one computer to control many laser machines, which save your resource.4. Storage function: Our controlling board includes the EMS memory that enables the user to store more than 100 files. 5. Real time regulation: The user can regulate the laser power automatically and manually according to his needs, so it can improve the engraving effect easily.6. Easy operation：Control panel in English and Chinese, the operation is very easy.7. Configuration fine：Our linear guide seat is one-time molding by aluminum material, difficult for distortion. Our linear guide rail, idler wheels and bearings are from Japan and Taiwan, which make the machine works very stably and precisely.8. Automatic Protection：There is automatic smoke dust ejecting system, water cooling system, if there is no water or the water flows in opposite direction, there will be no laser, which protects the laser tube in an effective way.9. Rotary clamps for engraving cylinders(Optional): Our laser engraving and cutting machine can be optional with equipping rotary clamp. So the machine can engrave not only sheets and roll materials, but also cylinders as pencil vase, flute, wine bottle and so on...10. Cover protection function: Our laser machine adopt the cover protection function, it means the laser machine will stop automatically during the working if you open the cover. When you close the cover, it can work again. This function can protect the operator's safty. Máy khắc cắt laser SA Hai đầu cắt Máy khắc cắt laser SA Hai đầu cắt.